Zarate was working upstairs at The Revolution Studio, a small barbershop on trendy Front Street in downtown Memphis. The job, which he had held for only a few weeks before getting busted, was like a dream come true for Zarate. 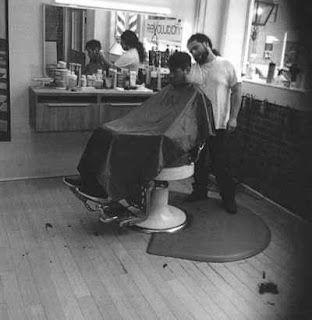 He'd learned to cut hair while helping out in his uncle's barbershop as a kid, and he had honed his skills over the years by cutting his siblings' and friends' hair. At Revolution, Zarate had served clientele from ordinary working-class to members of the Memphis Grizzlies, the local NBA team. My Comment: The requirement to have a high school diploma in order to cut hair should be rescinded. I would like to see a top to bottom review of all license requirements. Those that have no rationale other than keeping competitors from entering the market should be removed. Those that are irrational should be removed. Those that require years of training when the skill could be learned in one day should be modified to reflect the amount of training reasonably required. Those licensed in another state should have their certification honored in Tennessee. I am not opposed to all licensing. I kind of like that doctors and electricians have to be licensed. For health and safety reason there are some license requirements that are rational. However, why should a shampoo girl require 300 hours of expensive training? Washing my own hair is something I have been doing almost my whole life. Washing hair is not rocket science. I think I could do it. Yet, if I wanted to wash hair and get paid for I could not do so in Tennessee. Tennessee is one of only five states that require a license to wash hair. That is only one of many jobs that require a license in order to perform the work. If Tennessee should review their license policy, they should also examine those license that prohibit anyone from practicing the profession who has previously been convicted of a crime. It is difficult enough for an ex-con to reenter society without being excluded from many professions. Over time, the number of profession one can only practice if one has permission from the state has grown. It is time to examine all professional license laws and make them make sense. Government should not be in the business to keep people from earning a living.